So here’s my recap for the first week of my Paleo diet. In the first week I lost 3 pounds. I weighed in at (I can’t believe I’m actually to admit my weight and even go as far as to post pictures on here…. kill me) 117.6 pounds on day 1. YIKES! Believe it or not… my lowest weight throughout college was always between 116 and 118… so being 117 after having a baby was actually nice for me, ha. BUT like I said… my body was (and still is, really) absurdly flabby in all the wrong places. It is actually like my body is slowly melting. WHICH is the whole reason I started this silly diet in the first place… to lose weight and tone up. SUMMER IS COMING PEOPLE! What I like most about the Paleo diet is, it’s healthy! You are not depriving yourself of anything that’s good for you, ha. And it’s not like juicing, where the second you stop you gain back like all of the weight. They have really delicious recipes and even paleo desserts that won’t make you feel guilty after eating them! 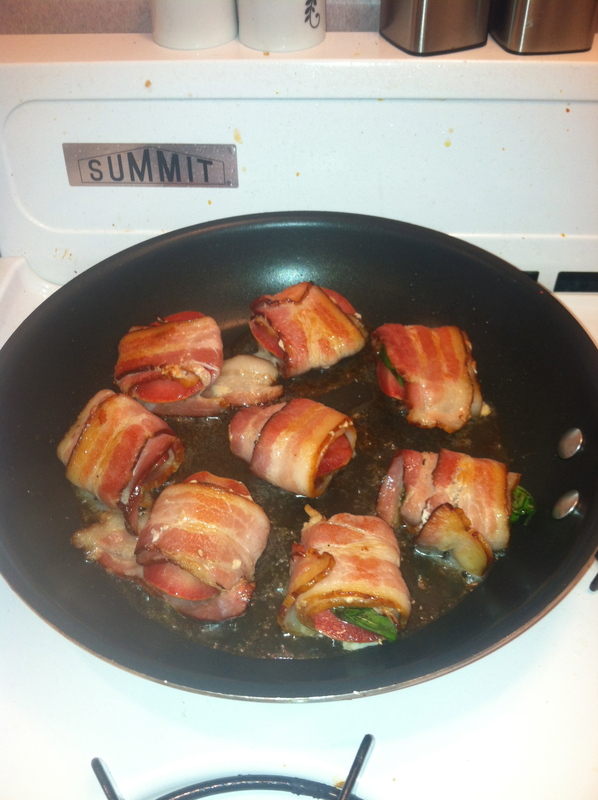 And apparently bacon is paleo… so, I mean… there is a god. Ok, so here we go. Brace yourself. And please don’t judge me haha! Left: starting weight. 117.6 pounds. Right: (exactly one week later) 114.6 pounds. Side note… spray tans are magical, aren’t they? Here’s the first item on your paleo diet list: (complete with pictures! you’re welcome). 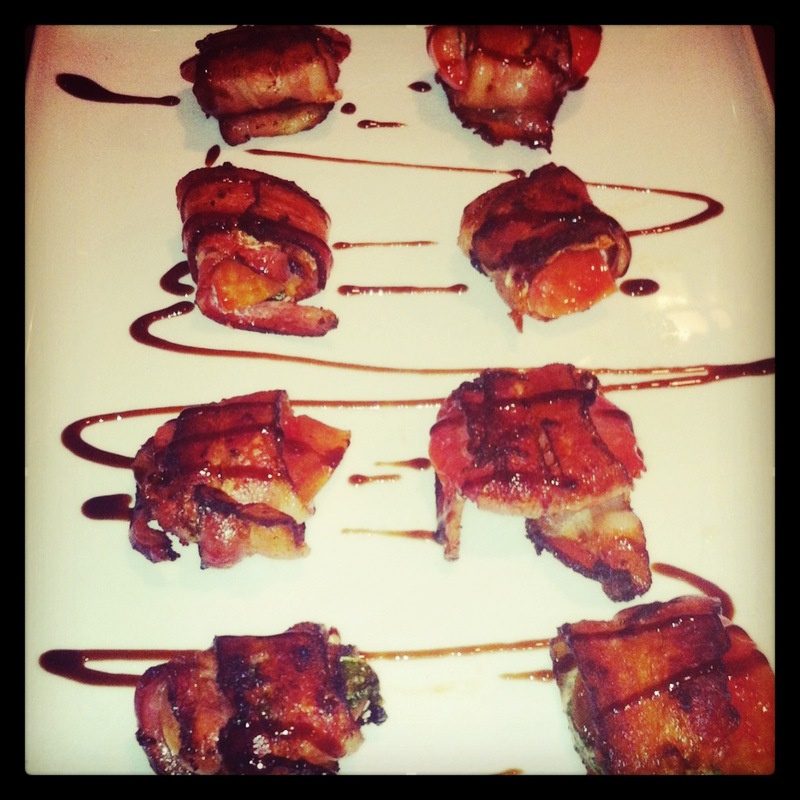 Appetizer: Peaches and Basil wrapped and ‘fried’ in bacon. This one is SO easy! All you need is coconut oil, bacon, peaches, and fresh basil and a frying pan. step one: slice up peaches and tear large leaves of basil. step two: on a large piece of wax paper or a cutting board, place the slices of bacon. At one end place the basil and slice of peach. Start rolling. step three: melt one tablespoon coconut oil in a nonstick frying pan. step four: place the bacon and peach wrap in the frying pan and ‘fry’ until the bacon is crisp and fully cooked, turning once. and voila! you’re done. that’s seriously how easy this appetizer is. You can sprinkle with a little balsamic glaze or vinegar to top it off. It’s really delicious! Who knew bacon was paleo? I certainly didn’t but I’m ecstatic that it is! haha. Tomorrow I’ll try to post another recipe for you guys, hopefully a main course one. Hope you guys enjoy it! Until next time, kisses! Previous PostPrevious Introducing the Diet Diaries! Next PostNext Recipe: “Spaghetti” with sautéed Kale.